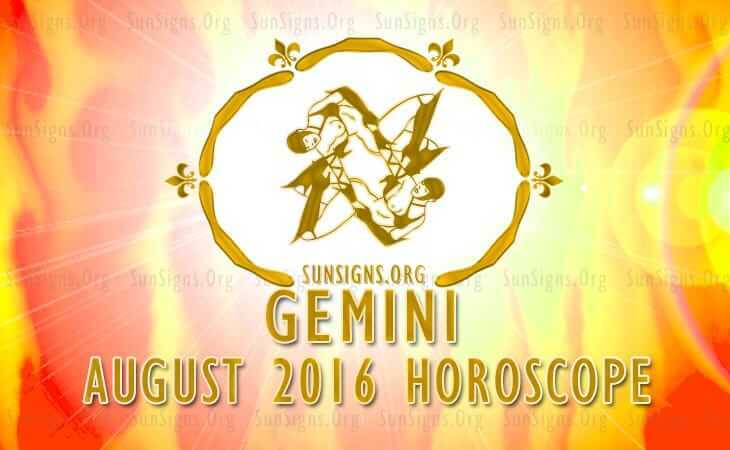 Gemini August 2016 Horoscope foretells that the Twins should focus on family and psychological matters during the month. Planetary aspects for career and business are not good and also thanks to the Mercury Retrograde. Things are happening slowly and it is time to take a break and regenerate your energies. The Gemini birthday people in August 2016 are caught between being independent for some time and being dependent on others during other times. Finally you have to rely on your social skills and adaptability for achieving your targets. Gemini, this month is excellent for improving your skills and indulging in your favorite hobbies. You can enhance your emotional quotient and make family life harmonious. The August 2016 horoscope for the Gemini forecasts that career development will be slow and new business ventures will not take off as expected. You have to be patient and wait for good openings in the job market. The Gemini August 2016 monthly predictions suggest that finances are powerful this month with the help of planet Venus. Money instinct will be good for the Gemini personality and will help risky investments to turn profitable. Saturn will moderate your risk taking capabilities. Business travel is indicated for widening the prospects. An investment in fashion and birthday jewellery industry is advisable. The Gemini man or Gemini woman is fickle minded and this is reflected in the field of relationships. You are assessing your current partnerships and may decide to breakup. New love relationships are also on the cards. Married Gemini will have difference of opinion with their spouses. These disagreements will disappear as the month progresses. Pregnancy related news is expected. Single Twins will be able to form romantic relationships while following their professional and monetary goals in August 2016. You will be looking for intellectual compatibility in your romantic and sexual partnerships. The Gemini 2016 astrology predictions suggest that your, health requires more attention. This is not the time to make major changes to your exercise and diet schemes. You should focus on conserving your vitality by eating nuts and dried fruits. Going for a jog everyday will improve your stamina. To conclude, the August 2016 Gemini horoscope suggests that this is a good month to work on your personality rather than trying to make quick money.